It might be called synthetic grass, but there’s real versatility to the humble strip of artificial turf. Let’s take a look at some of the interesting ways you can use artificial grass around the home. There are a couple of obvious places where you’ll get a huge boost from synthetic blades. The yard instantly springs to mind: who wouldn’t want to enjoy lush lawn the whole year ‘round? And, with minimal care required! But there are many other places where a splash of artificial green can really freshen things up. All you’ve got to do is get creative. 1. Table cloth or bar mat for the "man cave". Summer's nearly over and the cricket's coming to a close. Synthetic turf makes for a fantastic wicket when you're listening to the broadcast with friends on a summer afternoon. But it's just as good for sporty social occasions throughout footy season too. Make a habit of watching the games with a few mates? Bring the feel of the field to your lounge room, home cinema or man cave. All you've got to do is throw a segment of artificial turf over your table or benchtop. Within seconds, you've got a top-notch, readymade bar mat. And the best part? Synthetic turf is great for capturing crumbs and mess within the blades of grass, and there's no washing required. Simply spray it down with the hose after the game, and you're good to go for next time. Easy! 2. Safe and stylish pool surrounds. Everyone wants their pool area to make a splash. Your pool’s either the visual focal point of your backyard, or ground-zero for fun and games. Artificial turf is the easy way to cater for the best of both worlds: a lush strip of synthetic grass can make your pool area look stylish, while also making it much safer than a regular lawn. Normal grass will lose traction and turn to slippery mud over time, and while concrete and sandstone is popular, it doesn’t create the same atmosphere of pool-side paradise that a huge swathe of green grass can. Even just a thin strip around the perimeter can look fantastic and offer much better grip under foot. 3. Play surfaces for the kids. If you’ve got a swing set, trampoline, or cubby house in your backyard, chances are that some part of your lawn has been pulverised in the name of play. And let’s be honest, patchy grass is a bit of an eyesore. Synthetic turf is a great option as a playground surface, because it’s soft, durable and easy to clean. The kids can’t hurt the look of your grass, and it’ll be kinder to them if they take a fall too. Win/win. Thanks to those very same qualities, synthetic turf also makes for a fantastic play mat or rug for the kids’ rumpus room. Cut into any shape, an indoor splash of green is great fodder for imagination. Got a golfer in the family? With some artificial turf and a little bit of DIY, you can create an impressive indoor putting green. No need to worry about constantly getting out on the course – improve your short game in the comfort of your own home or garage with any length of sport synthetic turf. It doesn’t matter whether it’s wet, the middle of winter or just a mid-week night after work, you’ll be able to practice putting in perfect conditions - with a green that can be quickly packed away for easy storage and maintenance. 5. Arts & crafts around the home. Put the 'art' back into 'artificial grass' - this one's all about getting creative. 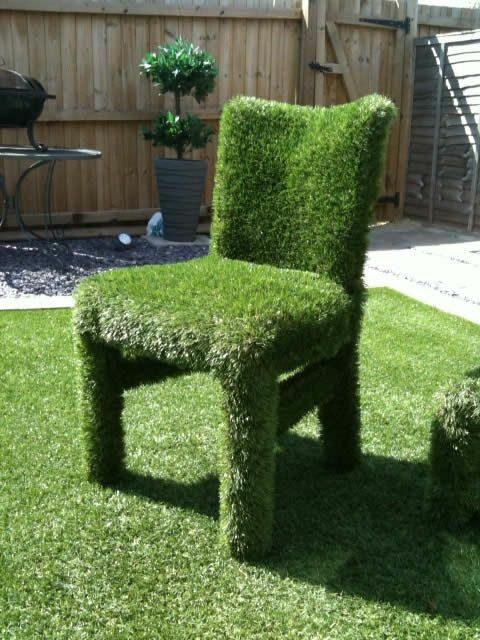 We've seen some inspired uses for artificial turf over the years. From quirky placemats for the barbeque table setting, to grassy-green street numbers cut from artificial turf, to seat and table covers for the kids' cubby house furniture, to outdoor and camping rugs, and even toilet surrounds! Take a look at some inspiration and let your imagination run wild! If you prefer an inner-city balcony instead of a big open backyard in the suburbs, there’s no reason why you can’t still enjoy a bit of greenery in your scenery. Artificial turf makes for a fantastic balcony surface. It can be easily cut to fit the dimensions of any space, it’s soft under foot, it’s low maintenance and simple to clean, and with a few carefully placed pot plants or flower boxes, you can bring a refreshing burst of nature back into the concrete jungle. 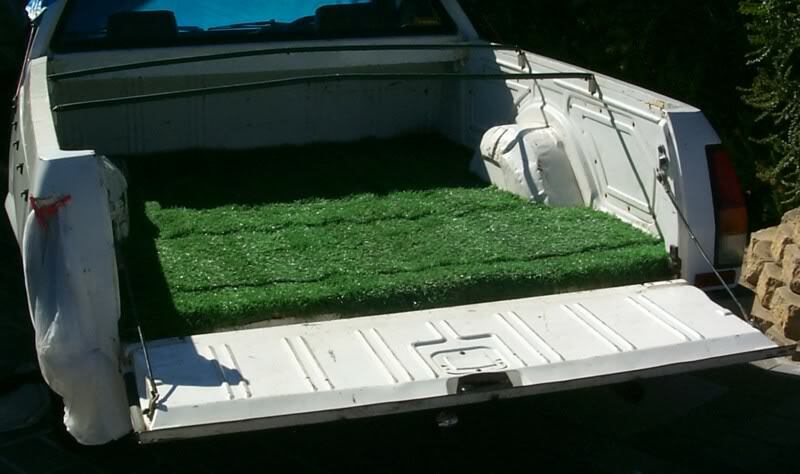 Most people won’t associate a trip to the worksite with lush green grass, but the durable and easily replaceable nature of synthetic grass means that it’s a fantastic option for lining the inside of a ute tray. Our all-purpose turf solutions won’t scratch the inside of the tray, and the longer blades provide cushioning that creates a soft, non-slip rubber surface for tools and equipment. Got an enclosed space where you keep your bins? Wood stack? Or maybe a section of your yard where your process compost? By lining the walls with artificial turf, you can easily cover up anything that might be detracting from the look of your backyard. 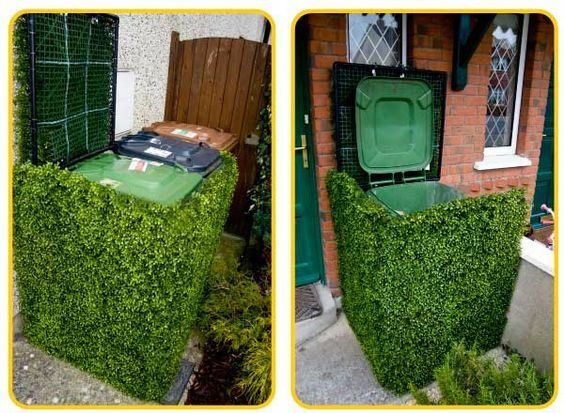 Outdoor walls and fences that are lined with artificial turf will create a bush-like appearance, so you can hide any amenities or storage spaces with a natural looking, leafy hedge. Camouflage and class in equal measure. Grab your synthetic turf, and start getting creative today. You can also check out our article on caring for your synthetic grass. And if you’ve got any ideas that we haven’t covered? Let us know! Synthetic grass is a vibrant addition to any garden. Watch our 15 minute installation video and you will be ready to create your dream landscape.